With the Dell EMC virtual Edge Platform 4600*, powered by Intel® Xeon® D-2100 processor, Communications Service Providers can break away from the closed proprietary CPE solutions of today and regain their freedom to innovate with open solutions. 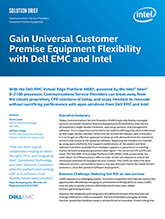 Sign up now to learn more about how CoSPs can gain universal customer premise equipment flexibility with Dell and Intel. First name must be less than 255 characters long. Last name must be less than 255 characters long. Email Address must be less than 255 characters. Company name must be less than 255 characters long. Please enter a business phone. Business phone must be at least 2 characters long. Business phone must be less than 255 characters long. Please enter a valid business phone.